With all the spotlight rightly focused on improvements on the pitch, we may be ignoring another significant rebirth at Anfield. As a certified old timer, I can confidently say that the grand old stand has been like a mausoleum for many years. Admittedly it does flicker into life on big European nights, once again reminding us of what we used to take for granted. I started following the Reds in the early 70′s. I have very vivid memories of my first game. It was against QPR and I was in the Paddock (at the Kop end). However, those memories fade when it comes to the scoreline. I think it was 1-1 and my Dad says we had a perfectly good goal disallowed. 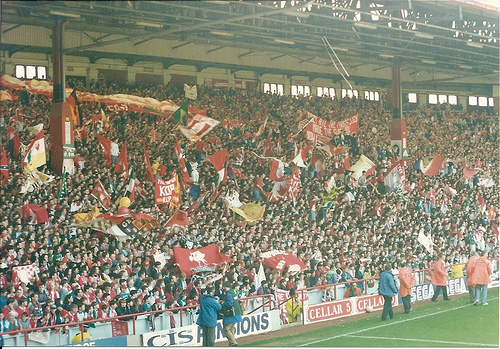 However, my recollections are all about the Kop. I literally spent the whole game mesmerised by it. It moved like a vast red ocean , swaying from side to side. As the team approached the opposition goal huge swathes of bodies surged forward as one. Then there was the songs. They seemed to start up spontaneously, and in an instant thousands were singing in tune and perfect unison. It was also very very loud. I would have to admit that back then the Kop was potentially a dangerous place to stand. One of the sights that captivated me included watching people crowd surfing from the back of the kop to the waiting St Johns Ambulance crew at the bottom. These were unconscious people, who had passed out in a terrace, so densely packed, the only way out was over head. It’s amazing I have never heard of anyone seriously injured at this time. As I grew up and started going the game on my own I stood on the Kop. My mission was to get in early and get a good “spec.” For me this meant getting to the middle by the big posts. This was where the singing seemed to start and if you were in-front of the steel columns, you had a decent view of the game. I would have to get to the ground hours before kick off, ready for the turnstiles to open, and I’d run onto the empty terrace, making my way to the middle. All would go well until about 5 minutes before kick off. With the ground now nearing capacity you were no longer guaranteed your spot. 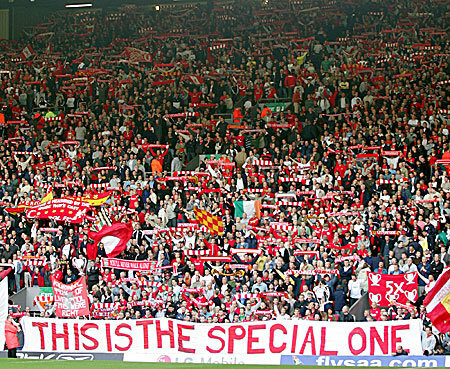 By full time I was usually separated from my mates, and in a completely different part of the Kop. The noise, the atmosphere wit and the songs were incredible. I loved it, and I mourn its passing at every game. That is until this season. We have witnessed a glorious renaissance on the Kop this season. Gone is the moaning and whining that usually accompanies the teams failure to be 3-0 up after fifteen minutes (at least in Block 109 anyway). The noise levels have been cranked up, and the singing has been continuous at times. The player songs have been typically inventive, and original. When I was a kid we used to sing each players song during the warm up. They would stop and salute the crowd as they heard theirs being sung. I am sure it would have given them a lift before the game. Nowadays the ground is half empty during the warm up, it would be great if we could put that right next season. As the season wore on the atmosphere got better and better for me. Crowds were turning up to greet the team coach, and hundreds of young Kopites were starting their own traditions, singing their own songs and most importantly carrying that into the ground for kick off. This is the next generation of supporters creating a new Kop history, so their kids will have a story. The City game was the pinnacle for me. Before, during and after the game the feeling in and around the game was sublime. It is the only game in all the years that got close to mirroring the halcyon days of Anfield for me. I remember leaving the ground at full time with tears in my eyes. We had agreed to meet in the ‘Twelfth Man’ for beers and celebrations afterwards. It was so packed we had to leave in minutes. I heard later that a mate had been upstairs in there, only to bale out because he whole floor was swaying underfoot. We ended up in the ‘Flat Iron’ where it was full long after kick off. We have been given countless memories this season that will live with me for a long time. The re-emergence of the team, and the resurgence of the Kop has gone hand in hand. This is how it was in the old days. The team the manager, and the supporters. The holy trinity, working together as one; and greater than the sum of it’s parts. Just imagine if we had won the bloody thing. The club will undoubtedly strengthen in the summer. So should the supporters. We need to get ready to go again. Next season will be tough. Clubs will work hard to counteract our relentless attack, especially at Anfield. The crowd will need to get behind the team before, during and after every game, regardless of the result. The inevitable and hopefully occasional set backs must not derail us. Patience will also be key. We set a bench mark in support during 2013-14, let’s see if we can surpass it next time out. We needs songs and passion from all four corners of the ground. Who knows it could just give the lads that final ten percent that pushes them over the line.